Leicester goalkeeper Kasper Schmeichel says the helicopter crash that killed the club’s revered Thai owner Vichai Srivaddhanaprabha will haunt him forever after he witnessed the tragedy. The 32-year-old Danish international — speaking after Leicester had beaten Cardiff on Saturday in their first match since the crash, which also killed four others — waved the helicopter off following the 1-1 draw with West Ham on October 27. Moments later it came down, with Schmeichel reported having been stopped by police as he ran towards the burning wreckage. “I was on the pitch and I waved him off,” said Schmeichel, before he flew with teammates and coaching staff to Bangkok to attend Vichai’s funeral. “I saw it all happen. It is something that will stay with me, unfortunately. It’s not a nice memory but I’ve had all the support that I need. Schmeichel joined Leicester in 2011, a year after Vichai bought the club, and was a pivotal figure in their fairytale Premier League title win in 2016. He admitted to shaking as he warmed up in Cardiff before the game on Saturday. The goalkeeper, who had the Thai national flag on his gloves, then joined his teammates and backroom staff around the centre circle to pay tribute to Vichai and the other victims. “It was tough,” said Schmeichel, who had grief counselling during the week. “But we wanted to do it for the chairman and his family. “We wanted to be together about this, because we’ve all lost what feels like a family member. “Wes (Morgan the captain) said a bit, I said a bit. People had a lot to say because he meant so much to so many people. Everyone wanted to chip in. Schmeichel, who faces another emotion-packed game this Saturday when Leicester play their first home match since the tragedy against Burnley, said Vichai transcended the traditional image of a Premier League club owner. “When he took over this club it was in a pretty precarious situation, and to build what he has is quite amazing,” he said. “It’s one thing building a team and a club that can perform on the pitch but we’re more proud of the family that he’s created and the feeling he’s instilled in everybody being welcome. 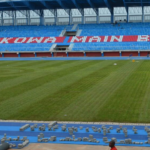 FIFA approves Stephen Keshi Stadium in Asaba for international football matches.